They filter in half an hour before Sanjay Subrahmanyan’s fourth concert of the December music season at the Bra­hma Gana Sabha. Exchange pleasantries and enquire if the others have reached. “Where is Prabha Mami?” asks one of them. Oh! She is already in the balcony queue. Somebody answers. The lights dim and they are all seated in the large hall. You can’t see them in the darkness but feel their enthusiasm—their shared love of music and for the 50-year-old vocalist, a Carnatic music superstar. This motley group will be in attendance at all of Subrahmanyan’s ten more concerts lined up for the season. They have reserved their seats in advance. They would follow him from hall to hall as the Barmy Army would tail the English cricket team. “Call it our musical fix. If Sanjay is singing we will be there. We are there for his music…pure, free-flowing and totally joyous. My wife and I have been attending his concerts in Chennai for more than a decade,” says Shankar Subramanian, a fan. What keeps them hooked is the variety their idol offers, whose repertoire is such that he rarely repeats a raga or a kriti during a season. Also, he comes up with rare compositions whose existence even many senior artistes were unaware of. “If he sings ten items at a concert you can be assured there would ten different ones at the next. He even takes care not to repeat a raga. Not easy because singers are most comfortable singing a few favourite ragas. But Sanjay keeps throwing up surprises we do not want to miss,” says Prabha Ramani, a homemaker from Chennai. She attended every concert except during her daughter’s pregnancy. The Subrahmanyan fans got together four years ago after discovering their common interest at concerts. Some had already been in touch over email and SMS. The arrival of WhatsApp bonded the group like instant glue. This is Sanjay Bhaktha Jana Sabha, a fan group formed by Aravind Nata­rajan, who accidentally discovered Subrah­man­yan’s musical genius at a reality show in 2011. “Though no fan of Carnatic music, I stayed on for Sanjay’s concert as I saw the hall fill up. As I listened I got transported to a different world. I became an addict to his music,” says Aravind who has a score of 300-plus Subrahmanyan concerts to his credit and named his son Aditya Sanjay. WhatsApp handle of his followers. The WhatsApp group is an organic unit. Other than updates about his concerts, it decides who picks the tickets when someone is unable to. “Since the Music Academy sells its unreserved tickets only on concert days we line up at 4am for tickets to Sanjay’s event. And since only two tickets per person is allowed, those living closer to the academy are chosen. Sabha officials can recognise the Sanjay groupies and ensure they somehow get a ticket. It is like Rajnikanth fans managing to corner the first day first show tickets for his movies,” chuckles Aravind. 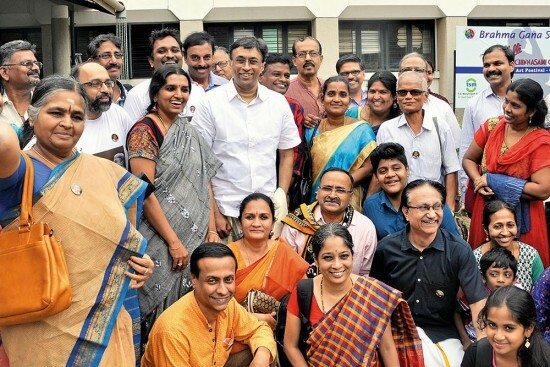 The group even had a get-together to celebrate the Music Academy’s “Sangeetha Kalanidhi” title to Subrahmanyan in 2015. The singer’s fan group is like the Barmy Army of the English cricket team, attending each of his concerts. The fan base spills over to Karnataka and Kerala. Sajeesh Warrier from Kochi follows Subrahmanyan to all his concerts in Kerala. The vocalist once asked him why he was not around at a concert after having requested a particular raga. “That is another quality of Sanjay. He can spot his regular fans in the audience. He responds to fans’ comments sent through emails. In early stages of his career when I pointed out that his voice was weak and his pronunciation not clear, he graciously replied that he was keen to correct these. And today the flaws have been ironed out,” observes Shankar Subramanian. Another long-distance fan is Rajappane Raju of Oman. 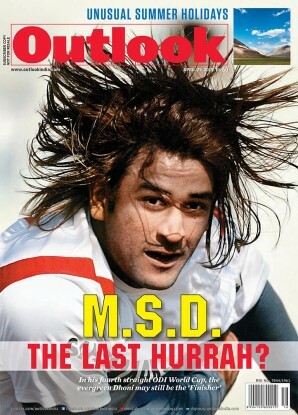 He listens to Subrahmanyan and photographs him—facial expressions, dripping sweat and the hand gestures of a spin bowler. “Sanjay is not just a listener’s delight but also a photographer’s. His music is naturally expressive and a camera freezes its unrestrained flow,” says Raju. Since he could attend only three concerts this time he will be travelling to the Swati Thirunal event in Trivandrum in January. According to Narasimhan, he and Subrah­manyan used to be followers of famed Carnatic singers Madurai Seashagopalan and Thanjavur Kalyana­raman. “We would be present at every concert in Chennai. Once Seshagopalan asked over the mike “Enna late-aa” (why are you late) when he saw us sneaking in when it was pouring heavily outside,” Narasimhan says.